Using examples like discords in music, A.H. Munsell explains the concept of unbalance of color in this section of the Introduction for the 1921 book, A Grammar of Color, published posthumously by the Strathmore Paper Company. We are presenting each section of the Introduction as well as the rest of the book as part of series of blog posts to make the entire text available online here in our Munsell Color Blog. 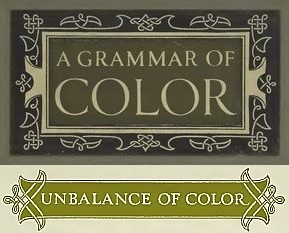 The introduction includes sections on The Color Sphere, Balance of Color, and Unbalance of Color. That any long duration of unbalance, either mental, physical or spiritual is an aggravated form of disease may be easily shown. Yet short periods of unbalance are very stimulating in the effort which they produce to regain balance. We see this in the introduction of discords in music. In contortions of the body. In intentional inversions of thought. This also shows in the seasoning of our food. Too sweet, too salt, too sour. It even shows in our criticism of pictures. We say, too light, too dark, too hot, too cold, too weak, too strong, and the effort of the accomplished artist is to overcome these forms of unbalance. The introduction of a color scheme of a certain moment of unbalance is called harsh color, it leads to its correction by what we call harmonious color (really balance); and the contrast enhances the latter; so that to overcome monotony, we should be able to use unbalance wisely at times, in order that the general balance may be the more evident. This is sometimes done in the picture gallery by means of a so called “gallery of horrors;” — in music by a sudden discord; in behavior by an unexpected rudeness;— all illustrations of the value of the contrast between harmony and discord; and this quality of contrast is proportioned to the use of color. If it is to serve as the background of the picture, the color must be quiet. If it is to be the makeup of the pictures themselves there must be strong oscillations in the contrasts of light and dark (Value), of hot and cold (Hue), of weak and strong (Chroma). As in the case of advertising color, especially in the open air, the very strongest contrasts and even strident relations are admissible. Any attempt in this sketch to encompass this broad question of color harmony would be impossible, and only the few suggestions are attempted to balance and unbalance, to contrast and to accent here mentioned, with their limited illustrations printed in the colors of the various cover papers.